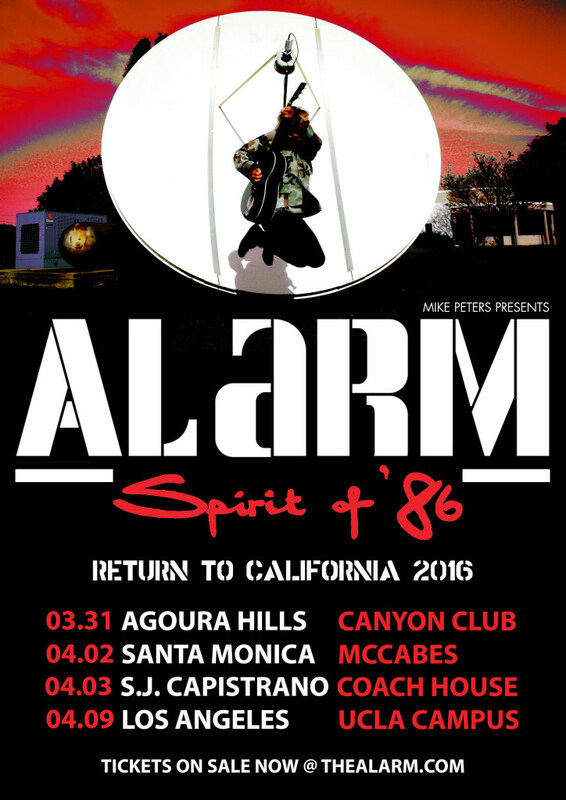 This March 30 and April 2/3/9 Mike Peters will present The Alarm – Spirit of ’86 in California, USA. Beginning on March 30th with a show the Canyon Club in Agoura Hills, the short tour will also pay a return visit to the legendary McCabe’s in Santa Monica on April 2nd, followed by The Coach House in San Juan Capistrano on April 3rd. 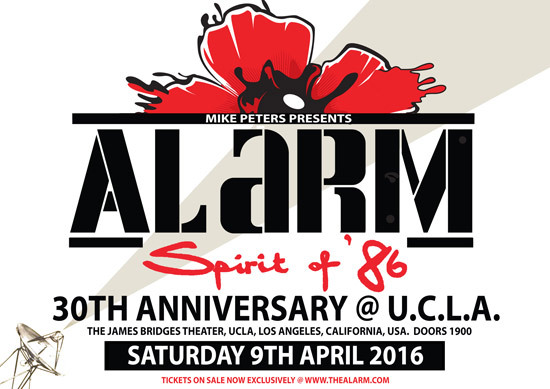 April 9th will see Mike Peters host a ‘Spirit Of ’86’ 30th anniversary special event at UCLA in the James Bridges Theatre celebrating the events of April 12th 1986 when the The Alarm performed the original ‘Spirit Of ’86 Concert’ at the foot of Janss Steps on the UCLA Campus that was beaned around the world by MTV. 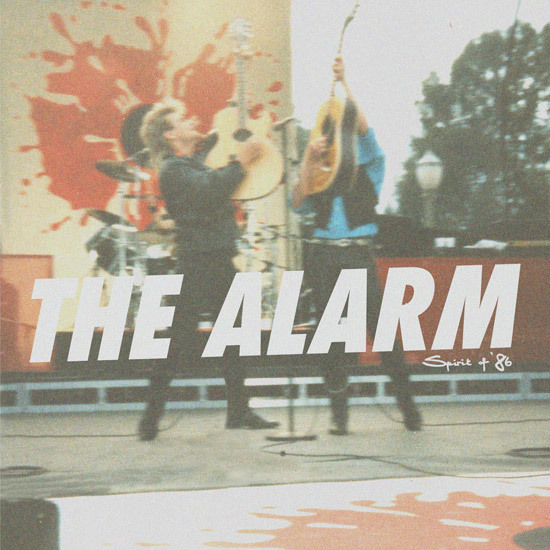 Mike Peters presents The Alarm ‘Spirit Of ’86’ – 30th Anniversary Concert at The James Bridges Theater, UCLA on Saturday April 9th 2016. 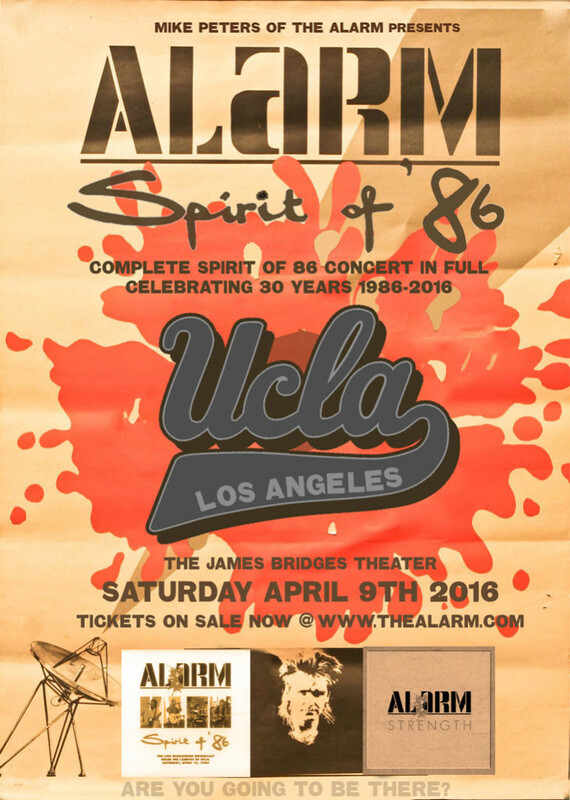 Return to UCLA with Mike Peters this April 9th 2016 and celebrate the 30th Anniversary of The Alarm’s historic open air concert from the foot of the famous Janss Steps that was broadcast around the world via MTV in 1986. The event will feature a world premiere movie screening of brand new Hi Definition, re-mastered footage of the original concert, that was first transmitted live on April 12th 1986. The evening will feature an up close and personal Q & A with Mike Peters, meet and greet signing session and acoustic performance. Every person attending will qualify for a signed reprint of the original UCLA poster. 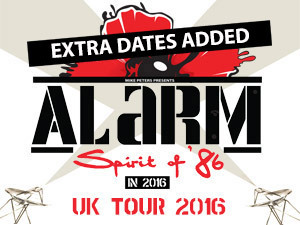 The concert event will also coincide with the release of a brand new 30th Anniversary Edition ‘Spirit Of ’86’ DVD package, featuring newly restored ‘Spirit Of ’86’ concert footage, upscaled into Hi Definition from a recently sourced first generation broadcast master, located deep in the MTV Vaults. A special collectors’ Vinyl Edition LP of the remixed concert audio soundtrack (Produced by Mike Peters), will also be available on the day, in advance of the official release date, scheduled for Record Store Day 2016 on April 16th. The new release will also incorporate an accompanying brand new Documentary which was filmed on location at UCLA, telling the story behind the songs on the ‘Strength’ album and all the events leading up to the original UCLA concert, along with exclusive concert footage from the unforgettable night, when Mike Peters rocked the world famous Cavern Club in Liverpool, and infamously, led the entire audience “out on the street”, for an impromptu post-concert performance of ‘Spirit of ’76’, below the ‘Four Lads Who Shook The World’ memorial on Mathew Street itself. 235 Charles E Young Drive N.
Tickets are priced at £25 ($40) [no booking or card fee]. NB: Event Itinerary times are approximate and subject to change.